Evidence is mounting that one of Asia's most authoritarian leaders, Uzbek President Islam Karimov, has died of an illness after 27 years in power. Mr Karimov, 78, was taken to hospital last week after a brain haemorrhage but the government has only said that he is critically ill.
On Friday, the Turkish prime minister and international news agencies reported his death as fact. Uzbek state TV channels have dropped light entertainment programmes. Mr Karimov, who has not appeared in public since 17 August, has no clear successor. There is no legal political opposition and the media are tightly controlled by the state. A UN report has described the use of torture as "systematic". Mr Karimov often justified his strong-arm tactics by highlighting the danger from Islamist militancy in the mainly Muslim country, which borders Afghanistan. 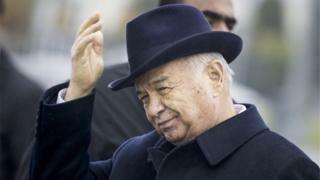 Turkish Prime Minister Binali Yildirim told a televised meeting of his cabinet that Mr Karimov had died, saying Turkey shared "the pain and sorrow of Uzbek people". The President of Georgia, Giorgi Margvelashvili, also expressed condolences in a statement on the presidential website. "I'd like to express my condolences from me personally and on behalf of the Georgian people to the president's family and Uzbek people," he added. A Russian-based opposition website, Fergana, reported that preparations were under way for Mr Karimov's funeral in Samarkand, the historic city where he was born. Samarkand's airport has been closed to scheduled flights on Saturday. Unnamed diplomatic sources in several countries announced funeral travel plans to news agencies. The Associated Press cited an unnamed Afghan official as saying President Ashraf Ghani planned to attend Mr Karimov's funeral on Saturday, and an unnamed Kyrgyz diplomat as saying the country's prime minister had also been invited to the funeral. Kazakhstan Today, a privately owned news agency, said Kazakh Prime Minister Karim Masimov was preparing for a visit to Samarkand on Saturday. Amid the confusion, leading Russian news agency Interfax announced the death, quoting the Uzbek government - only to withdraw its report later, citing a "technical error". "Yes of course, it's a price for stability, because we see what is happening now in Syria, in Iraq, in Yemen, in Afghanistan and even in Europe - you cannot defend yourself from the terrorist attacks," Sherzod Igamberdiev, a lawyer in Tashkent, told BBC News. "If you put all your efforts into stopping terrorism, you will have criticism, but we live here, we know the situation on the inside, we are satisfied with him, we love him." Uzbekistan was long one of Russia's strongest allies among other former Soviet states but strains appeared in recent years, notably when Tashkent suspended its membership of a Russian-led military alliance, the Collective Security Treaty Organisation. Analysts say Mr Karimov has played Russia, China and the West against each other to keep Uzbekistan from total isolation and to receive limited US aid. In 2014, Russia wrote off most of Uzbekistan's foreign debt to Moscow, forgiving $865m. Russian presidential spokesman Dmitry Peskov said on Friday the Kremlin had no confirmation Mr Karimov might be dead.